Katy Perry always finds a way to surprise us. Whether she's the Christian singer who grows up to marry and then divorce bad boy comedian Russell Brand, or the high school dropout who becomes one of the most successful songwriters of all time — she continues to intrigue and delight. Last week, when she accepted the Human Rights Campaign National Equality Award, she made reference to her 2008 song, "I Kissed A Girl", and said she “did more” than that. "How was I going to reconcile that with a gospel-singing girl raised in youth groups that were pro-conversion camps?" she said. “What I did know is that I was curious, and even then I knew sexuality wasn't as black and white as this dress. And, honestly, I haven't always gotten it right, but in 2008, when that song came out, I knew that I started a conversation that a lot of the world seemed curious enough to sing along, too." So let’s looks at the multiple ways Katy continues to grab out attention. 1. Katy Perry’s full name is Katheryn Elizabeth Hudson. She changed it when she launched her pop career in 2001 because she didn't want to be confused with the actress Kate Hudson. 2. Katy’s parents were Pentecostal Christian pastors who didn’t let her watch The Smurfs or read Harry Potter. She was also discouraged from listening to secular music and sang in the church’s choir. 3. When Katy was 15, she started making trips to Nashville, Tennessee, to start recording gospel songs. That’s where she learned to craft a song and play guitar. 4. Katy Perry dropped out of school when she was only 15 and said she regrets it. "I'm kind of bummed at this stage that I didn't have a great education because I could really use that these days,” she said. Did you know that Katy once helped deliver a baby? 5. In 2001, she released her debut gospel album called Katy Hudson, with its lead song, "Trust In Me". "I was feeling a little depressed at the time, and was thinking about all the things I'd done wrong," she said. "I started writing about this and God placed a peace in my heart. I really felt He was saying, 'Don't worry child, trust in me.'" 6. Katy helped deliver her older sister’s baby, who had a water birth in a friend’s living room. Perry filmed the delivery on her phone. 7. 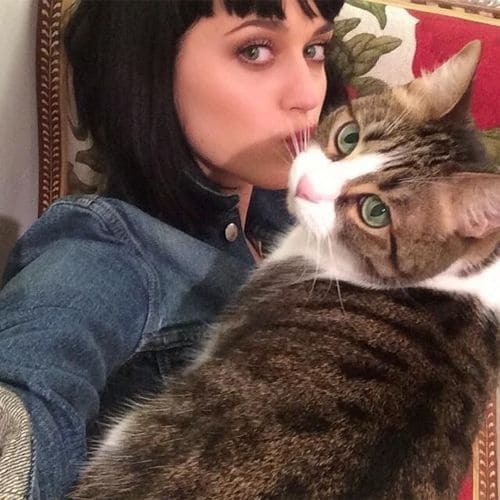 Katy Perry has a cat called Kitty Purry, who has her own blog and was nominated for a 2009 Teen Choice Award in the category of Choice Celebrity Pet. Kitty lost out to the Obama’s dog, Bo. 8. Katy’s ex-husband, Russell Brand, texted her to say he was filing for divorce. Do you know what Katy's secret skill is? 9. Katy and Rihanna have been friends for years and often talk about collaborating on what they think will be the "best song ever". 10. Katy’s hangover cure is an In-N-Out burger and a Sprite. She also suggests meditation and sleeping “the whole day away”. 11. When former boyfriend Orlando Bloom decided to take his clothes off to go paddle boarding with Katy, the images sent the internet into meltdown. 12. Her special talent is doing an impression of a frog — a skill she learned when doing vocal training.